They were all crying- Deve Gowda, his son Revanna and grandson Prajwal Revanna. No, they were not crying for the death of dynasty politics, but in fact for the perpetuation of it. In a dramatised manner, Former Prime Minister HD Deve Gowda announced on Wednesday that he will not contest the Lok Sabha elections from the Hassan constituency. 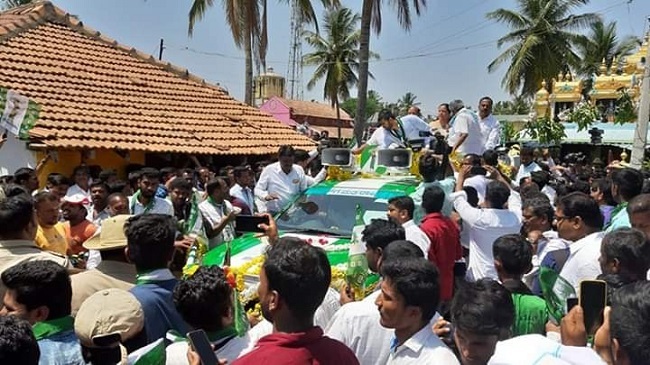 Speaking at a public campaign held in Mudalahippe village in Holenarasipura taluk in the district, Deve Gowda, the incumbent MP, also said that his grandson Prajwal Revanna will be the JD(S) candidate from the constituency taking over from him. “I have decided I will not stand for the elections from here,” Deve Gowda told reporters. He, however, could yet contest for the JD(S) from the Bengaluru (North) constituency or the Mysuru-Kodagu constituency. Prajwal Revanna is the son of Karnataka PWD Minister HD Revanna. The duo celebrated the news at their residence in Holenarasipura and also embarked on a tour of temples. Deve Gowda thanked the people of the constituency for standing by Prajwal. HD Revanna and Prajwal appeared to be visibly upset at Deve Gowda’s announcement and television visuals showed that both leaders were in tears during the campaign. Deve Gowda has made the Hassan constituency his bastion over the last three decades. He has been the MP from Hassan constituency since 2004 and has won three elections in a row defeating HC Srikantaiah of the Congress, KH Hanume Gowda of the BJP, and A Manju of the Congress. He had earlier been elected from the constituency in 1991 and 1998 and was defeated in 1999. Deve Gowda further added that the Congress and JD(S) are yet to decide on the seat-sharing arrangement. “Out of the 28 Lok Sabha seats, we have not decided how many Congress will contest and how many JD(S) will contest. A meeting will be held on Friday with Rahul Gandhi in which a final decision will be taken,” he added. JD(S) had earlier asked the Congress for 10 Lok Sabha seats out of the 28 seats in the state as part of the pre-poll alliance struck between the two parties. Prajwal could contest the elections against A Manju. The former Congress minister has apparently expressed his displeasure to the party leadership for allowing the JD(S) to field Prajwal from Hassan. BJP sources say it is likely that he will defect to their party, paving the way for him to contest against Prajwal. State BJP President BS Yeddyurappa has also indicated that Manju has met him two or three times and has his approval to contest from Hassan. Manju was earlier a minister in the Siddaramaiah-led cabinet and is also close to him. However, he is reportedly unhappy that Deve Gowda has picked his grandson over him as the candidate from Hassan. Meanwhile, the BJP accused Deve Gowda of playing dynasty politics by giving way for his grandson to contest from the Hassan constituency. This comes after Nikhil Kumaraswamy, his other grandson and son of Chief Minister HD Kumaraswamy, was confirmed as the coalition’s candidate from the Mandya constituency. Kumaraswamy’s wife, Anita, is an MLA from Ramanagara Assembly constituency. Reacting to the question of dynasty politics, Prajwal Revanna told reporters that the BJP was looking to field Yeddyurappa’s son BY Raghavendra from Shivamogga. “Tell me who is contesting from Shivamogga from BJP and we will discuss after that,” he retorted.